Martir’s presentation will focus on the building of his empire and how he went from being an artist painting canvases to having a multidisciplinary studio of 24 people working in lighting, video, set, costume, AR, and VR, while also developing their own code. USITT also snagged a few moments with Martir at USITT 2018 in Fort Lauderdale to discuss his influences and how he turned failures into successes. “I love it here; it’s like home,” he said at last year’s Conference. “I love coming in, seeing people, seeing industry people, but also seeing the new generation of designers that are coming through and what they’re doing, what they’re actually caring about, and what technologies they’re looking at.” Read the full interview, here. Martir is a visual designer and creative director with a varied portfolio of projects in the arts and entertainment internationally. Dubbed a “lighting magician,” and a “creative visionary,” Martir has created beautiful works of visual art all over the globe both on his own and with his team of visual artists and makers at Satore Studio in the UK, the design firm he founded. He has provided production design, visuals, and lighting direction for a slew of celebrities including Elton John and Beyoncé, as well as the Coachella Music Festival to name but a few. His work has been published in major publications, such as Wallpaper* Magazine, Live Design or LSI, and he is well-known for creating unique productions for several art forms, like fashion, music, theatre, opera, and ballet. 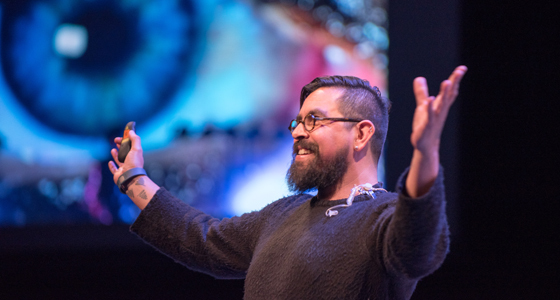 Share in the marvel that is Tupac Martir at USITT19 during the Early Career Honors on Thursday, March 21, at 12 p.m. The event will also recognize our best and brightest new talent in the industry.